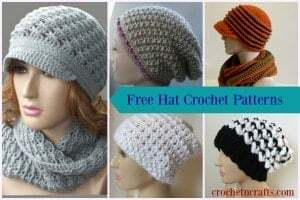 You can use just about any yarn or crochet thread to make this crochet headband pattern. It not only works great with Patons Brilliant, but it also looks great in Red Heart Luster Sheen and a size 3 crochet thread. Basically any similar yarn will result in a nice lacy fabric. I have not tried it with a worsted weight yarn, but I imagine it would work as well. The only difference is that you might end up with a wider band. Plus you wouldn’t have to do as many repeats of the pattern rows. 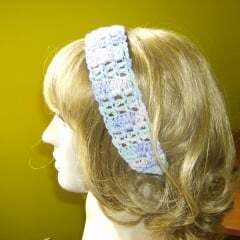 What I really like about this crochet headband is that it has quite a bit of stretch to it. The stretch is created in rows 5-7 with the chain 2 spaces. The headband is lacy and can be worn on just about any occasion by young girls, teens and adults. It is easy to adjust in length if a different size is needed, and it ties at the back with two strings. Another great thing about this headband is that the stitches are very simple, making it a suitable beginner crochet pattern. You might also enjoy the popcorn headband, the wide crochet headband or this easy breezy headband. Finished size: 2″ wide and 15″ long (not counting the strings). Row 1: Ch 52 for string, 3 sc in 2nd ch from hk; turn. Rows 9-51: Rep rows 5-8, ending with row 7. Row 56: Ch 1, sc3tog, ch 50 for string. FO.